PLEASE NOTE THIS TUTORIAL IS OUT OF DATE and is based around "Yellow Tweetdeck". If you are using "Blue Tweetdeck" then please visit How To Use Tweetdeck (Blue Version) for the related tutorial which will be updated soon. How many of you have signed up for Twitter and have got a bit lost or bored using the web format? Are you using Twitter on your phone and not really understanding what all the fuss is about? 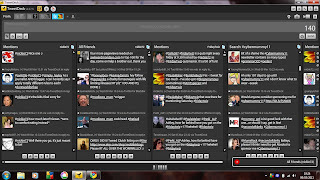 Tweetdeck is the best web application for managing Twitter that I have come across. 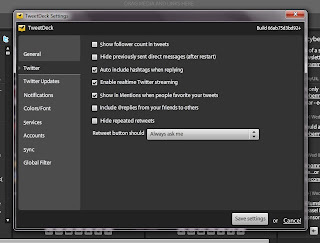 Tweetdeck flattens Twitter and lays out all the facilities on one screen so you don't have to refresh the screen or switch tabs for updates. 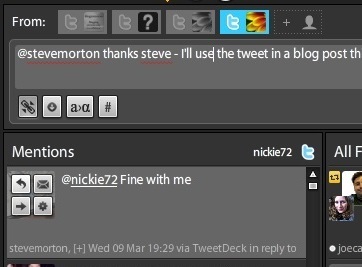 Once you get to grips with Tweetdeck it all becomes clear. 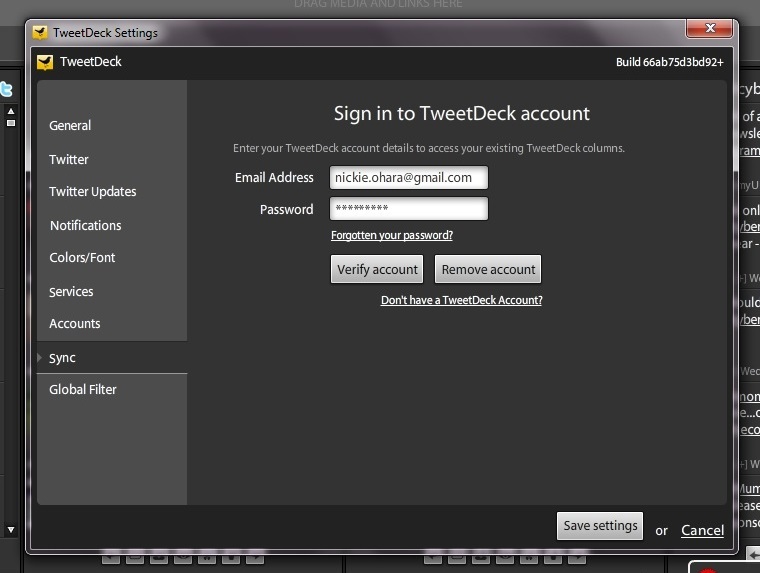 The easiest way to become familiar with the application is to actually download and use Tweetdeck. An "Application Programming Interface" (API) is like a middle-man between online services. 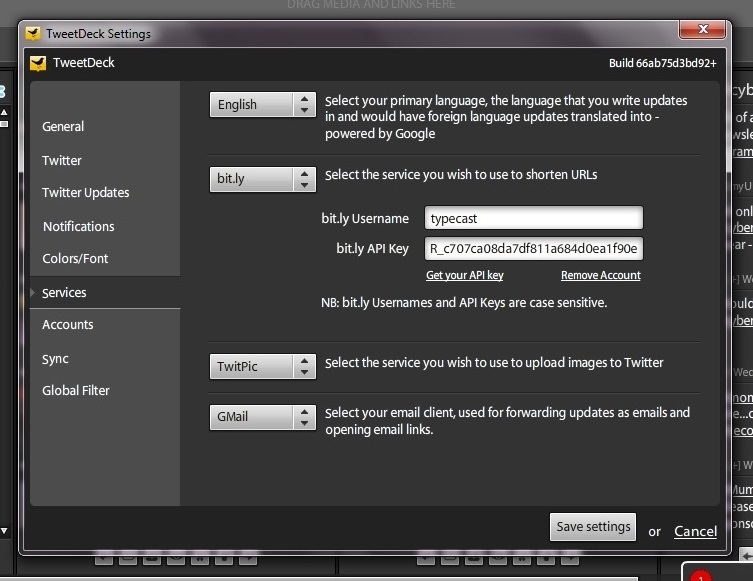 Twitter uses API calls to control the updates. You are allowed 350 of these per hour. 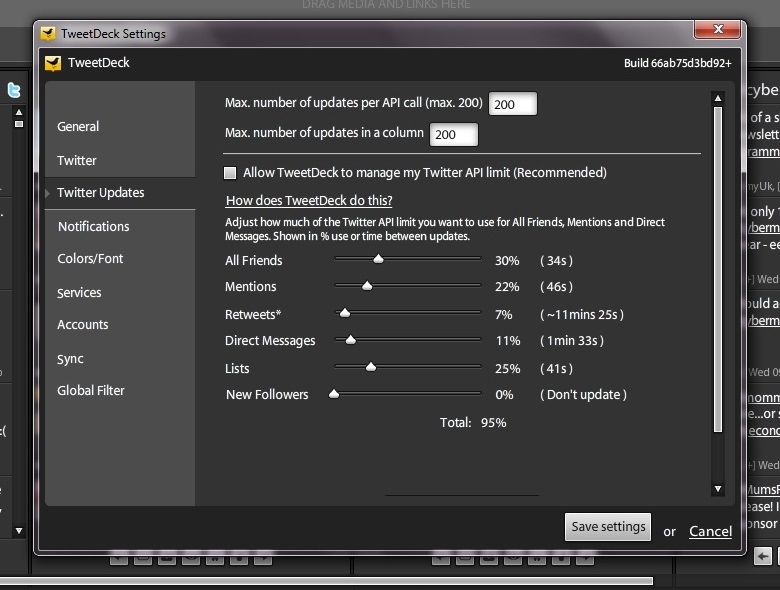 Every action on Twitter uses one or more API calls. This includes updates from @friends (one API update), previewing pictures/videos (two API updates) and viewing profiles (three API updates). More about this later. You can choose to keep all or some of these columns. My personal "core" is Mentions (@nickie72), All Friends, Direct Messages, #column(s) for the this particular twitter session, Mentions (@FridayTwiz), Mentions (@IAmTypecast). To delete a column hover over the blue "t" at the top of the column and it will turn into a "x", then click. Don't panic, you can always get that column back! 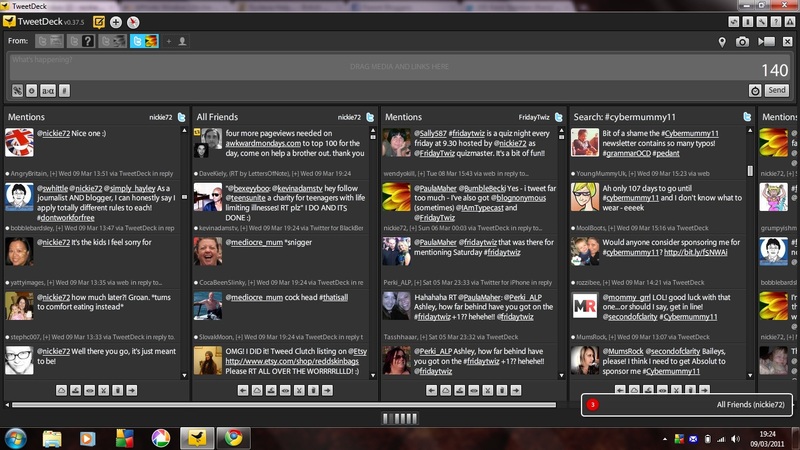 This is what the top part of Tweetdeck looks like. This is the main control centre and where you will type your tweets. It's worth knowing your way around here. Add column - add a column from the "core" to enhance your Tweetdeck use. Log Out - I have no idea what this button does Use this to log out of Tweetdeck, especially if you use a shared computer. each social media account you have linked to Tweetdeck - this could include all your Twitter accounts, Facebook, Four Square, LinkedIn, etc. Schedule an update - use this to tweet something at a time when you know you won't be able to access Twitter. Send - sends your tweet. You can also just hit "enter". HOW DO I REPLY TO TWEETS? All tweets addressed to you will land in your "Mentions" column (you will also see them in the "All Friends" column too - that shows they are part of the public timeline). You can do so much more than just reply to tweets. Steve and Jayne tweeted me earlier and when I hover over their avatars there are a number of options available to me. First of all I chose which account I wanted to use by highlighting the appropriate avatar at the top. The curved arrow is the "reply" button - this will @name a reply to whoever has tweeted me. The envelope will send the @name person a Direct Message (DM). This isn't to be confused with a private message. The DM can still be accessed but does not appear in the public timeline. You have a separate column for these messages. The arrow pointing to the right is the Retweet (RT) button - use this when you want to share someone's tweet with all your followers. You can choose to do a "native" RT (so it's retweeted as it appears) or an "edit" RT (when you add your own comments). 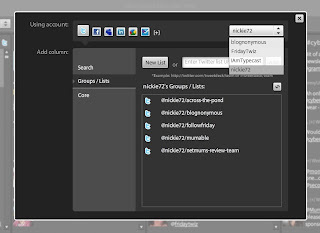 Add to group/list is a facility used in conjunction with your "core" columns. You can choose to have extra columns with fellow tweeps in groups or lists so that you have quick/easy access to certain people. At the bottom of each column on Tweetdeck you will see these icons. Hover over them to find out what they do but the most important one is the left arrow. If you click this the whole column will move once place to the left. This enables you to order your columns exactly how you want them. 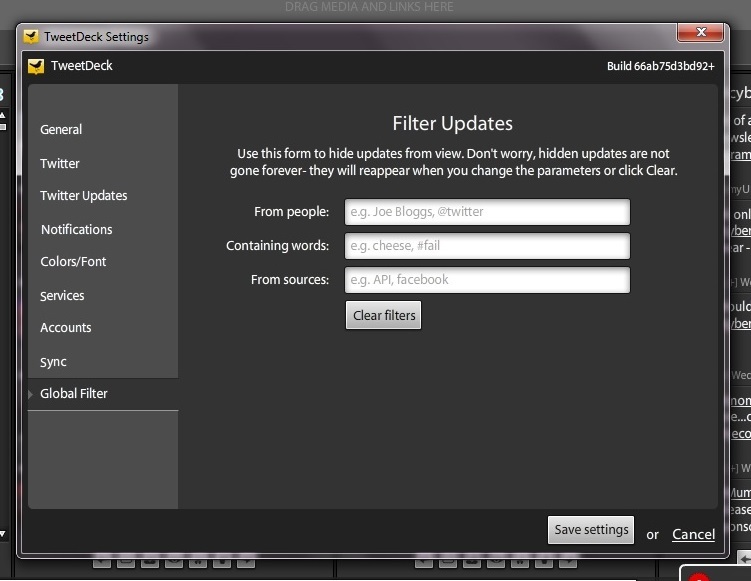 HOW DO I SET UP TWEETDECK PROPERLY? Make sure Tweetdeck works for you and not the other way around. 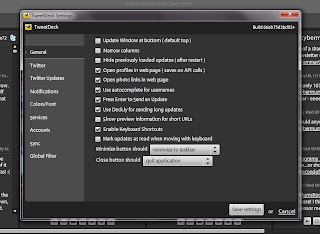 You have to have a look at the settings so that you receive the notifications you want and so that the applications that work with Tweetdeck are also working to their full potential for you. Click the spanner in the top right hand corner to access the settings window. Here are the screen-grabs for my settings with some notes under each one. Spend a little time trying different combinations - what works for me, doesn't necessarily work for you. Most of it is self-explanatory. If you choose to hide previously loaded updates then you will start your Twitter session with completely blank "Mentions" and "All Friends" panels. 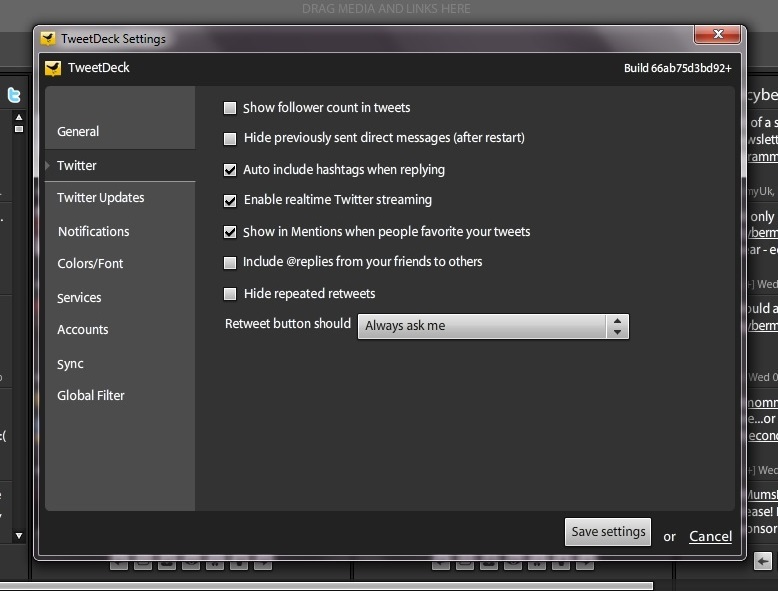 The same applies if you choose the same option for "Direct Messages" on the next screen. It is also worth mentioning the "auto-complete for usernames" facility here. If you have this option ticked then each time you start typing a @name a small pop-up box will appear with that configuration of characters in @usernames. Simply select the one you want to tweet and hit enter. This saves time and eliminates the possibility of spelling mistakes in @usernames. If you "include @replies from your friends to others" you will see a number of tweets to people you don't follow. This could be a good way to find new people to follow but it will fill your timeline with extra tweets and use up some of those precious 350-per-hour API calls. 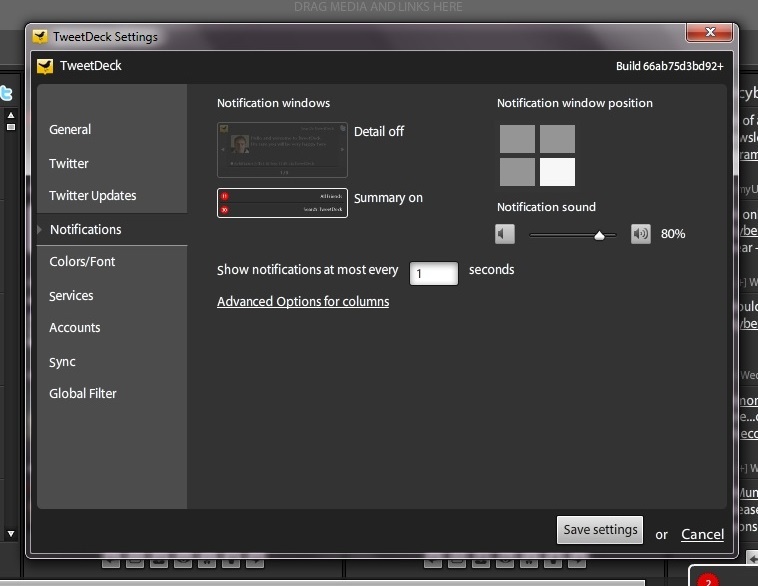 You can choose how often you have your twitter notifications drop into Tweetdeck. I have the box ticked that allows Twitter to manage my API for me. I find this works best for me. 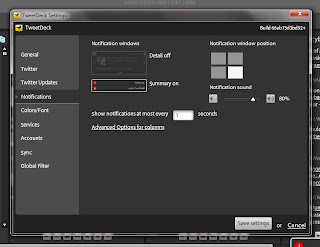 Set up your notification pop-ups, sounds and colour scheme exactly how you want. 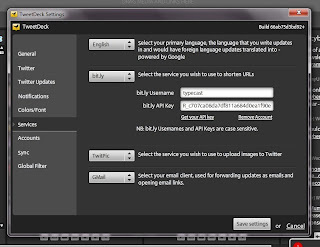 Define which language you would like to view your updates in, which services you want to use for short URL's, pictures and videos and the default email client you use in case you want to email tweets to non-users. Add all of your Twitter, Facebook, Four Square, MySpace, Buzz, LinkedIn accounts here. You can set your "default" account for any one of these. 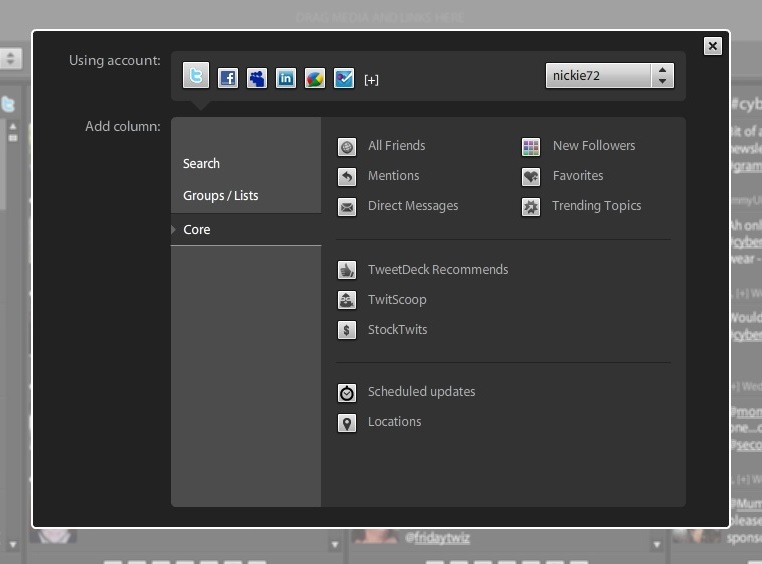 You can have a separate column for each account and update all your social networks from the one platform. For example, if you put #in after your tweet and you have your Linked In profile connected to Twitter, that particular tweet will appear on your Linked In profile. The same facility is available for Facebook through services such as Selective Tweets using a #fb hashtag. 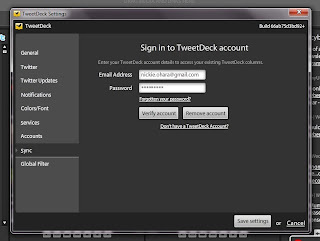 If you create a Tweetdeck account you can use it to sign in on different computers that have Tweetdeck installed. And here is where the magic happens - the wonderful global filter. If you don't fancy seeing updates from your friends who watch "Glee" then enter the word "glee" or "#glee" into the "containing words" section and the tweets that include that word will be filtered out of your timeline. You can do the same with people's names and updates from Facebook or other sources. Don't forget to click "Save Settings" when you have finished streamlining your settings. 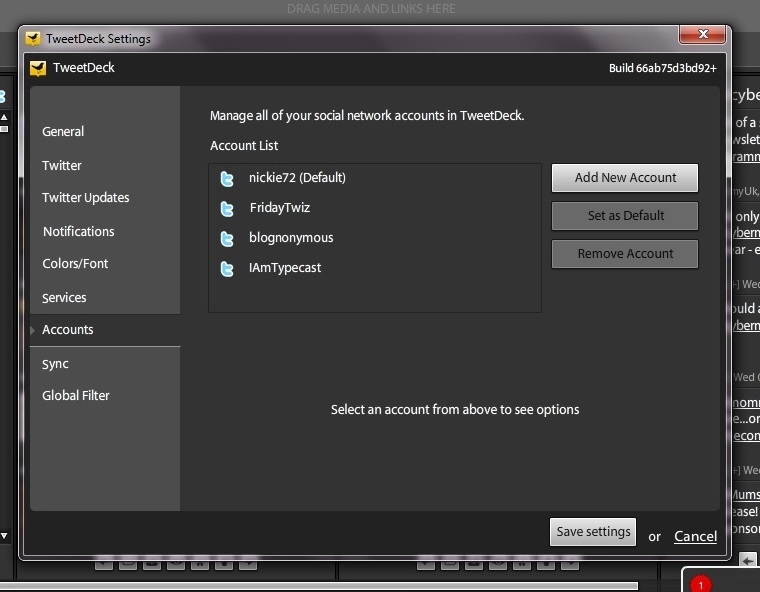 SO WHAT ELSE CAN TWEETDECK DO FOR ME? Now you are getting to grips with Tweetdeck you can use Tweetdeck as your base to update your other social media network accounts. 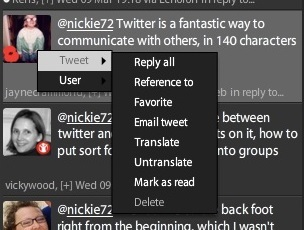 The "core" screen is accessed by clicking the "+" button at the top of the Tweetdeck panel. The "add accounts" facility is linked to the settings panel which we have just seen above. Click the appropriate icon and follow the instructions. The drop-down menu (top right) allows you to access the "core" settings for each account. With the "search" tab highlighted you can find all recent searches or # trends (groups of tweets mentioning the same subject) and quickly add a column for that search. 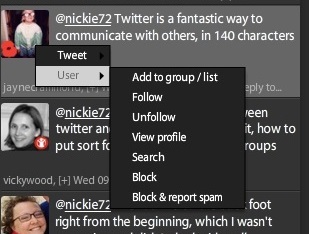 You will also also need to select which account you want the group/list to refer to by using the drop-down menu (top right) again. Finally, the all important "core". If you have lost/deleted any columns for any account this is where you will be able to add them to Tweetdeck again. You can also add the specific Twitter columns which display your Favourites (tweets that you have favourited), new followers, Tweetdeck Recommends (which is similar to the Twitter "Similar To You" or "Who To Follow"). Twit Scoop which shows you the current Twitter/Tweetdeck "trends" (what everyone is talking about - click on any of the trending words and a list of all the tweets mentioning that word will be displayed) and StockTwits (financial and stock updates). As you can see, you can also schedule tweets and fix your location from here as well as the top control panel. SCHEDULING? HOW DOES THAT WORK? You can schedule updates to tweet when you know you will be away from your computer or not able to access Twitter on your phone. Write your tweet but DON'T send it. Click "schedule" from the Core settings or hit the schedule button (alarm clock) from your control panel. As usual, to set this up is very easy and self-explanatory. Set the date and time that you would like your tweet to be set and then click "Set Time". This facility is very useful if you want to promote an event or if you want to remind your followers of a great blog post you have written. If someone you aren't following @mentions you in a tweet this will appear in your "Mentions" column only and not in your "All Friends" column. Everyone uses hashtags. Any word with a hashtag before is used as a keyword or "trend" - something that is popular. Hashtags are a great way to group tweets of a similar subject or to create a focus. There is no rule for hashtags but obvious ones are better. If you click on any hashtag it will open a new column in Tweetdeck and you will see all tweets that are currently using that hashtag. API was mentioned earlier and is precious, especially if you use Twitter a lot. If you use all your API calls in a short space of time you will not be able to use Twitter until that hour is up and the count refreshes itself (you may hear people talking about "Twitter Jail" - this is a euphemism for using up all your API). 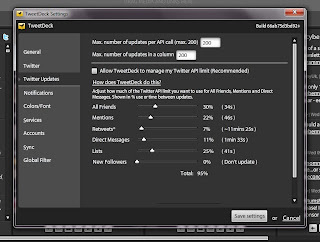 To save on API calls set your Tweetdeck up to open profile views, photos, videos, etc in a new web window as each action takes up one or more API calls. Twitter now uses "real time" streaming which means that as soon as one of your fellow Tweeps sends an update you will see it in the timeline. Originally, Tweetdeck only refreshed every 1, 2 or 3 minutes (depending on your time settings) which is why the "refresh" button exists. If you use real-time streaming you should not need to use the refresh button. If you have any questions or think I've missed anything out of this tutorial please leave a message in the comments and I'll answer it as soon as I can and edit the information into the post for future reference. 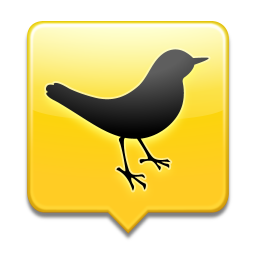 There are a number of other applications you can use for Twitter and social media (Hootsuite, Seesmic) but Tweetdeck is my weapon of choice. This post is not sponsored by Tweetdeck but if they fancy giving me a bit of recognition for it, I wouldn't say no!